In Other Media -e.g. Somalia, Nepal, Ghana, Azerbaijan, The Gambia For further info, click here to contact us . UNITED NATIONS, November 21 -- With the UN's Ban Ki-moon swinging from siding with Kosovo over to the side of Belgrade, he has delayed issuing his report on handing over powers to the European Union. 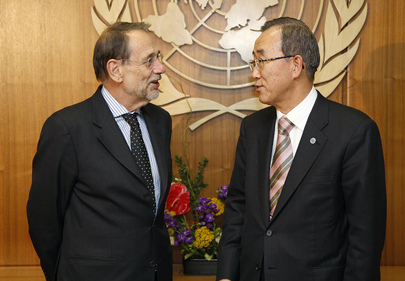 The EU's Javier Solana was at UN Headquarters on Friday, and Inner City Press asked him, with Pristina opposing the so-called six point plan, what is the way forward? Solana replied that he hopes that Ban finally issues his report, "early next week," because then and only then would EULEX be able to deploy by the beginning of December. Video here, from Minute 4:21. But many observers opine that Ban held off issuing his report precisely because the Kosovars objected. Now he is caught between a (Russian EU) rock and a Pristina hard place. One close observer of both Ban and the Balkans said that Ban is unlikely to win a second term, no matter how he now tries to assuage the Russians on Kosovo. But the pendulum has swung. Inner City Press also asked Solana about the arrest of three German citizens for attacking the EU's Pristina premises. Solana did not answer, just as Germany has not commented. Germany's defense minister was at the UN on November 20 but spoke mostly about the Congo and the pirates of Somalia. So too did the Greek deputy interior minister, who stopped to speak to the Press Thursday at the stakeout. Inner City Press asked him if Greece is involved in the efforts on piracy, giving its central role in shipping. A staffer assured that "yes," but has yet to provide information. Greece's foreign minister Dora Bakoyannis, meanwhile, was quoted that while her country has not recognized Kosovo as independence, a river can't be made to flow backwards. As Ban Ki-moon is finding out.